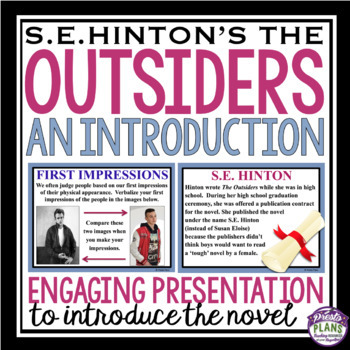 OUTSIDERS INTRODUCTION PRESENTATION: Introduce The Outsiders by S.E. Hinton with this interactive Powerpoint presentation (17 slides). 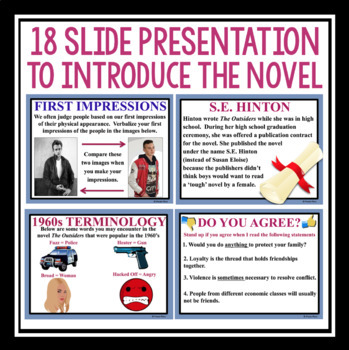 The presentation includes fun pre-reading discussion, an interactive class activity, an author biography, a fun review quiz, and background information on the novel. This Resource Is Included In My Complete Unit Plan For The Outsiders. Click Below! THE OUTSIDERS UNIT PLAN - 300+ Pages! ♥ Loved it. Great addition to my Outsiders Kick Off. ♥ Great! My students just loved it! It's a great introduction to S.E. Hinton, the novel, and vocabulary. Thank you! ♥ This was a great supplemental lesson to go with The Outsiders unit I teach. Thanks.